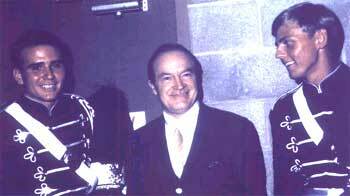 Anaheim Kingsmen drum major Earl Douglas, Bob Hope, and assistant drum major Don Hertel at a USO show at Anaheim Stadium in 1967. The Anaheim Kingsmen, a storied corps from Southern California (and DCI's first World Champions in 1972), shared a special relationship with entertainer Bob Hope, who died Sunday at age 100. "Mr. Bob Hope was a good friend the Kingsmen youth and staff for many years. We thank all of his family for allowing him to take time out to work with us and being an apart our lives I know that we all remember how he touched our lives over the years," said Kingsmen drum major Earl Douglas. The Kingsmen did several USO show during the late '60s and early '70s, according to Douglas, and they were the official USO musical representatives of Southern California.